Good ventilation and air quality is essential for industrial units such as manufacturing and processing plants. At one hand, it ensures that the workers employed at these units operate in a healthy environment. At the other hand, a good exhaust system effectively removes noxious fumes and brings in fresh air. The removal of potentially flammable gases also reduces the chances of hazards such as fire or explosion. In some cases, you business may even be required by law to ensure proper ventilation. Failure to do so can lead to fines and other forms of regulatory action. Industrial exhaust fans are an excellent way of achieving perfect ventilation at industrial units. These are heavy-duty fans that are tailored to suit specific ventilation or air supply needs. Whether you want a ventilation system for a chemical plant, a steel manufacturing plant, a waste treatment facility or any other industrial unit, you will find an exhaust fan that meets your needs perfectly. A huge range of these fans are available in the market, varying in size, performance, power and output. Roof-mountable industrial fans in particular have long been the go-to choice for most industrial facilities. Businesses all over Australia prefer this particular variety of ventilation because it is more effective in terms of costs and results. Roof mountable industrial fans are based on a simple principle. Hot air rises up while cooler air settles down. Fans located along the roof can more easily displace this hot air by sucking it out and replacing it with cooler air. The position of these fans enables them to dissipate the hot air by expending less energy, leading to energy conservation in the long-run. It also plays a vital role in maintaining a consistent indoor temperature for an industrial facility. Humidity is another major concern for business facilities that house heavy machinery and equipment. Excess humidity in the air can lead to a rapid degeneration of the equipment by encouraging corrosion, mold and mildew. Industrial exhaust fans for roof are also very beneficial in resolving this problem. By removing excess humidity, they are able to maintain an indoor environment that is suitable to both the workers and the equipment. Given the sheer range of industrial exhaust fans for roof available in the market, it can be a daunting task to choose one. The right choice depends on the size of the area to be ventilated and other factors such as the amount of impurities in the air. For instance, an environment which is more chemical-heavy may need more powerful ventilation that an environment which is simply high in water content. Temperature Regulation: Maintaining a consistent temperature is vital for industrial settings. A well-regulated temperature lets your employees work in peace while ensuring that the equipment does its job without any qualms. If the temperature becomes too hot or cold, it can disrupt the operation of the manpower and the machinery. Well-positioned roof exhaust fans are an excellent way of regulating the temperature indoors. These fans remove hot air that accumulates near the ceiling in summers, and bring in warmer air in winters to keep the temperature suitable. Energy Efficiency: Heating or cooling a large industrial facility consumes a huge amount of energy. This is why it is always advisable to implement energy-conserving strategies that can reduce the need for air-conditioning or heating. Industrial exhaust fans for roof can be a vital part of such a strategy. A good exhaust system can effectively remove hot air in summers and bring in cooler air, reducing the need for air-conditioning by a major margin. As a result, the air-conditioning unit does not have to spend as much energy. Healthier Environment: A healthy environment is important for workers at a facility. If the air they breathe is healthy, workers will be able to perform better and deliver more. Roof exhaust fans make this possible by allowing the flow of fresh air into a facility. At the same time, these fans are very effective in removing excess humidity which can be very oppressive and affect performance of the employees. Pollutant-Free Air: Many industrial processes involve the use or production of chemical fumes as well as other pollutants. These pollutants need to be removed from the workplace in order to ensure workplace safety and workers’ health. Failure to remove them in a timely manner may also result in violation of the relevant regulations. Roof exhaust fans are a one-stop solution to effectively clean a workplace of any and all pollutants. Cost-Efficient: Many industrial roof exhaust fans combine a creative design with cutting-edge engineering technologies. At the same time, they are optimally positioned on the roofs of industrial facilities. 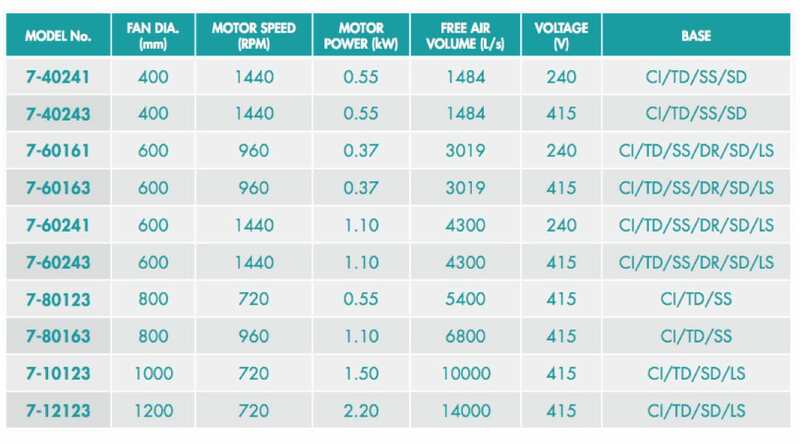 As a result, they are very cost-efficient and consume a relatively small amount of energy to deliver excellent exhaust and ventilation performance. This makes them a very sound long-term investment for businesses seeking to improve their energy conservation and the quality of their indoor environment. 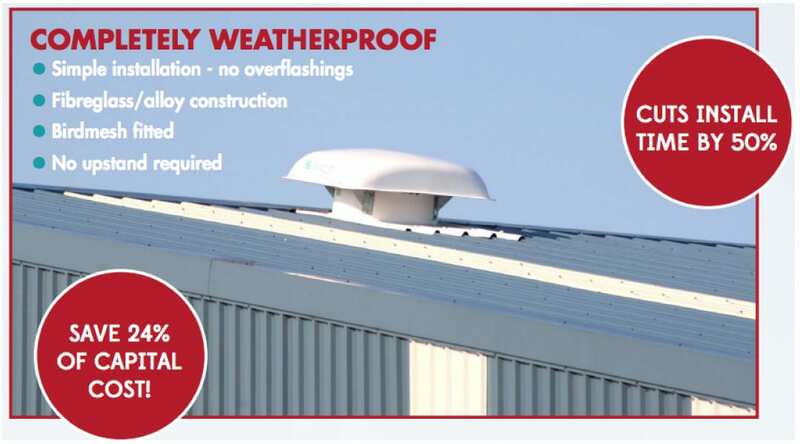 Durability: Most industrial-grade roof exhaust fans come constructed from incredibly durable and strong materials such as galvanized steel and fibreglass. They can withstand the weather conditions as well as the flow of vapour, chemical fumes, dust and other impurities from the air without incurring any damage. In the long-run, you need little to no maintenance for these fans. This means that once you install them, they will serve you in good stead for a long time. 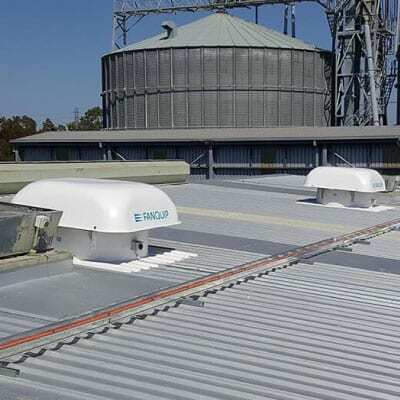 Warehouses, petrochemical plants, manufacturing units and other industrial facilities in Australia have long been using roof-mounted industrial exhaust fans. This is simply because these fans offer an overwhelming range of benefits when it comes to clearing the indoor air and regulating the temperature. Following are some of the key industries and applications that stand to benefit the most from this particular variety of exhaust fans. Warehouses: Warehouse store products in bulk. The merchandise stored at a warehouse may include textiles, packages foodstuffs, electronics, toys, chemicals and a whole range of other products. Nearly all products require storage at an optimal temperature range in order to stay in good shape. A temperature that is too high, for instance, may cause a chemical-based product to get damaged or worse, explode. An indoor environment that is too humid may end up damaging the electronics stored at the warehouse. This is why industrial roof exhaust fans are an excellent choice to ensure ventilation and temperature regulation at warehouses. Petrochemical Plants: Petrochemical plants process petroleum and other materials to create and refine a variety of derived products. The processes involved may cause the production of undesired fumes and chemicals while at the same time significantly hiking up the temperature. This can lead to an unhealthy quality of air indoors. Industrial exhaust fans resolve these problems brilliantly by offering a one-stop solution. They effectively remove the noxious fumes as well as the hot air from the indoors, replacing it with cooler, fresher and cleaner air from the outdoors. As a result, they improve workplace safety as well as the quality of air at petrochemical plants. Industrial furnaces and ovens: Industrial furnaces and ovens operate at exceptionally high temperatures. They also generate a lot of heat, increasing the overall temperature in their immediate vicinity. This is desirable as a higher indoor temperature at an industrial facility may become unhealthy or even dangerous for the workers. At the same time, adequate cooling must be done in a timely way to ensure that the furnace or oven equipment does not get damaged. An excellent way to achieve this is by using roof mounted exhaust fans. Industrial furnaces and ovens can be cooled more quickly and efficiently whenever required through the operation of these fans. Mining: Mining is a labor-intensive activity that also involves heavy usage of equipment. At the same time, when done underground, mining activity can generate a lot of heat and rapidly hike up the temperature. In many cases, mining and drilling can also create noxious fumes as well as dust particles which pose a serious health hazard to the workers. Good-quality industrial exhaust fans are very effective in such a setting. These fans effectively remove the dust, noxious fumes and excess heat in the environment. As a result, they allow the mining workers as well as the equipment to operate in more suitable conditions. Pharmaceuticals: Research, development and production of pharmaceutical products is a sensitive process. It requires a rigorously-maintained clean environment so that none of the products is contaminated or affected in any other way by the impurities in the air. The perfect way of achieving and maintaining such an environment is by using roof exhaust fans. Industrial ventilation offered by these fans ensures that the air remains clean, fresh and pure. By doing so, they help create an environment which is conducive to the research and development of pharmaceuticals. We have been the go-to supplier of industrial roof exhaust fans in Australia for many years. Over the years, we have worked with a large number of industrial units all over the country, delivering and installing a wide range of roof exhaust fans to meet various industrial needs. We pride ourselves in our unwavering commitment to an exceptionally high quality of service. Following are some of the key features that stand us apart from other suppliers. 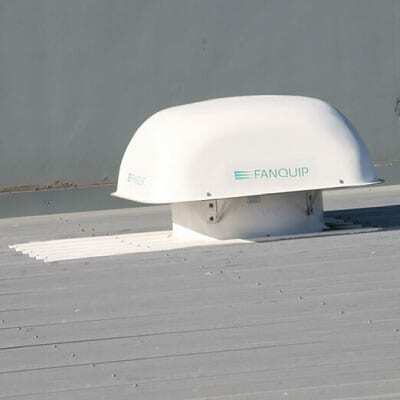 Wide range of products: Whether it is a warehouse, a processing plant, a manufacturing facility or any other kind of industrial unit, we have a wide range of roof mounted exhaust fans that perfectly cater to these different settings. 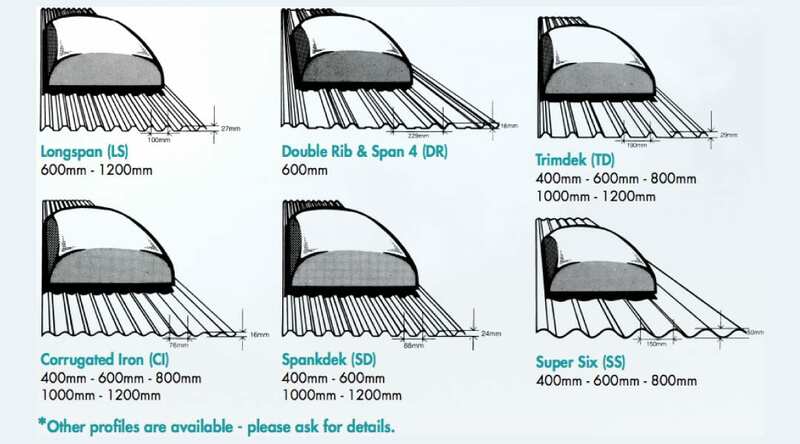 Our range of products meets different roof sizes, ventilation needs and power requirements. So you are sure to find a product that perfectly meets your needs. Qualified engineers and staff: Our professionals are highly qualified and fully trained in the installation of industrial exhaust fans. They have many decades of experience between them and have handled virtually all kinds of roof exhaust installation jobs over the years. When you hire us, you can be sure that the job is in the hands of industry experts. Our professionals will work with you from start to finish, providing post-installation support and help as well. 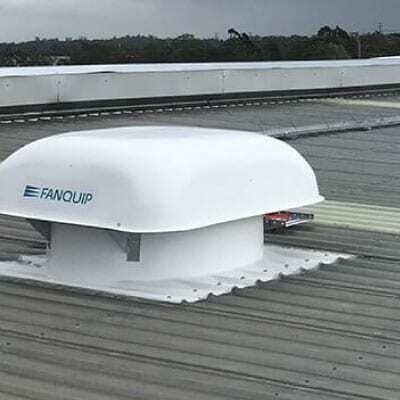 Australia-wide supply: Over the years, we have developed a supply chain network that enables us to deliver world-class roof exhaust fans to industries and businesses all over Australia. We also take pride in delivering our products in a very speedy fashion. Simply get in touch with us, place and confirm your order, and we will make sure that the product reaches your doorstep in no time. Transparency: We provide upfront price estimates and quotes. The estimates we provide include not only the cost of a product but also the installation costs as well. This ensures that you know beforehand the expenses involved and there are no hidden charges. We strongly believe in transparency and this quality permeates all our business operations. When you hire us or buy a product from us, you can be certain that there will be no surprise expense or last-minute price hike. Timely Service: For us, our customers come first. With this customer-centric approach, we strive to deliver our products and services in a very timely manner. When you contact us and discuss your industrial ventilation requirements, we will advise you on the right products and then help you choose them. Once you finalize a product, we will strive to supply and install it at the designated industrial facility in the briefest time possible. Improve the energy efficiency, air quality and indoor environment of virtually any industrial facility with our world-class roof exhaust fans. 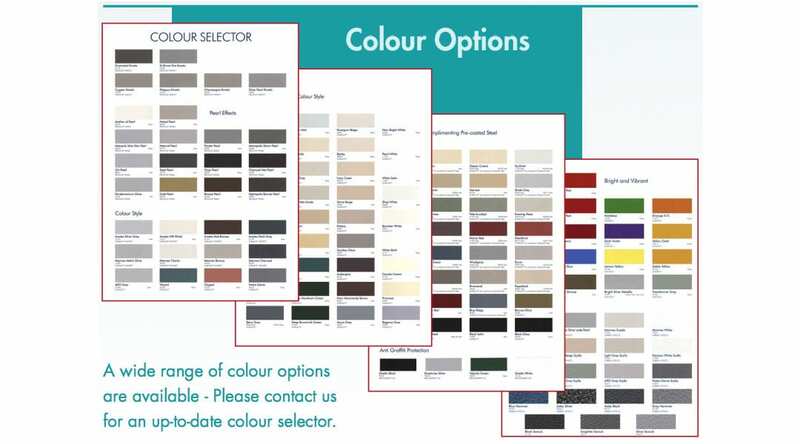 Browse through our vast range of products or get in touch to discuss your requirements in detail. We will make sure to provide you tailored ventilation solutions that deliver an optimal performance and exceptional durability.